Recently, I was chatting with @champagnediet on Twitter and mentioned my recent experimentation with a bottle of bubbly in the kitchen. 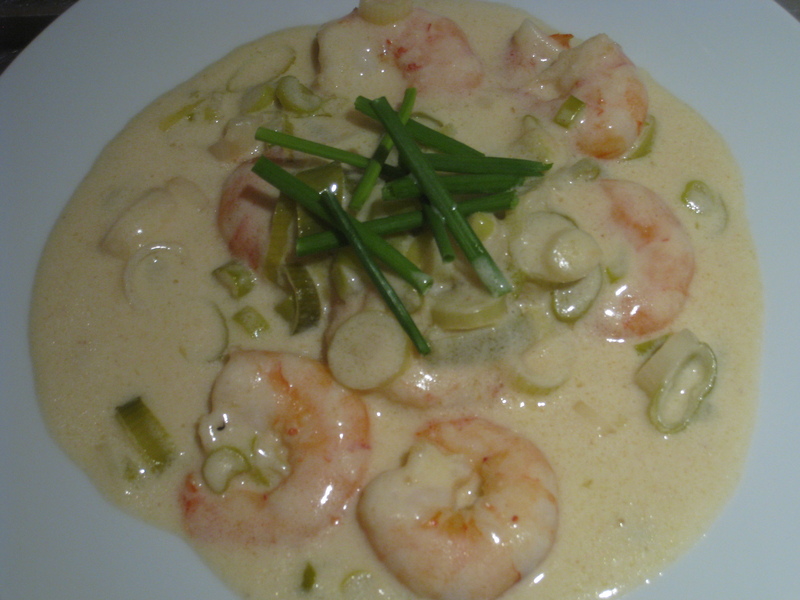 I’d made a truly scrummy dish of scallops and king prawns in a champagne and cream sauce – plenty for two people as a light evening meal, or a decadent starter if you’re hungry. Anyway, I promised @champagnediet I’d send her the recipe for her site, which focusses on how to eat (and live) well without over-indulging. Then I thought it would also be a good idea to share it here. This dish is ready in a flash. There’s next to no preparation time – just as long as it takes to get everything out of the fridge and chop the onions. Cooking time is max 10 minutes. 200g king prawns, uncooked and 200g fresh scallops, coral removed. In the UK queen scallops are good for this recipe as they’re smaller, but king scallops would work just as well, only you might need a minute or two more to cook through. 2/3 cup of champagne – don’t skimp. This has to be the real deal! I’ve tested with bubbly alternatives and the taste is still nice but not as good. Take a frying pan and melt 1 Tbsp of butter, adding a dash (literally) of light olive oil to prevent scorching. Add the chopped salad onions and stir over medium heat for 1 minute, no longer. We want them to retain their colour if possible. Slowly pour in the champagne and allow to reduce to approximately one third, stirring occasionally. Add the seafood and stir until the prawns have turned pink (2-3 minutes). Add the crème fraîche and stir until the cream has combined with the butter and seafood juices and now coats the seafood easily. Allow the mixture to simmer for a few minutes. Stir regularly during this time, then add the remaining butter and stir through until the sauce thickens slightly. Garnish with a sprig of dill or sprinkling of chopped chives. Serve immediately, preferably with a flute of the leftover champers! Et voilà!